The holiday season for me is all about the giving and not the receiving. I know I have told you all many times how much you mean to me but I thought what better way to express it than with a month full a giveaways. Each week there will be a new giveaway that will help you get full prepared and glammed up for this festive time of year. To start the giving month I've teamed up with London Times. You might remember a dress of theirs I wore two ways a few weeks ago (HERE). They have a huge selection of gorgeous dresses for every occasion that are very budget friendly. Their dresses are not only chic but they are comfortable and so versatile which is important when you want to get the most out of you money and wardrobe. When I saw the London Times holiday collection I fell head over heels (no pun intended) in love with each one. From the pleating to the lace details these dresses are stunning and perfect to go from holiday work parties, family functions and even to New Years eve in. Trying to decide which one to get is definitely a hard decision but I know which ever dress you might wear will be prefect for celebrating the holiday season. 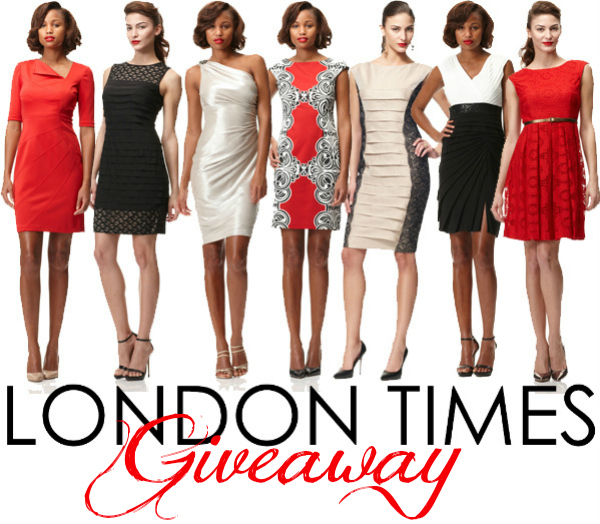 Now for the giveaway- London Times is offering one lucky beijosTiffany reader a $100 gift card to their store so you be stylish and chic while celebrating the holiday season. You must be a US resident. Giveaway ends Monday, December 10, 2012 at 11:59pm EST. Love the Holiday header for your blog!! Love the Dot Mesh dress! Great giveaway! I am entering! I love the lace fit and flare dress! I also love the black and white dress you are wearing! I love the Jersey and Lace Shutter dress.